How much do Blues suites cost? St. Louis Blues suite pricing will vary based on the suite level, opponent and day of the week. At the Enterprise Center, formerly Scottrade Center, there are three different types of suites and two suite levels. Club, Penthouse and Double suites. 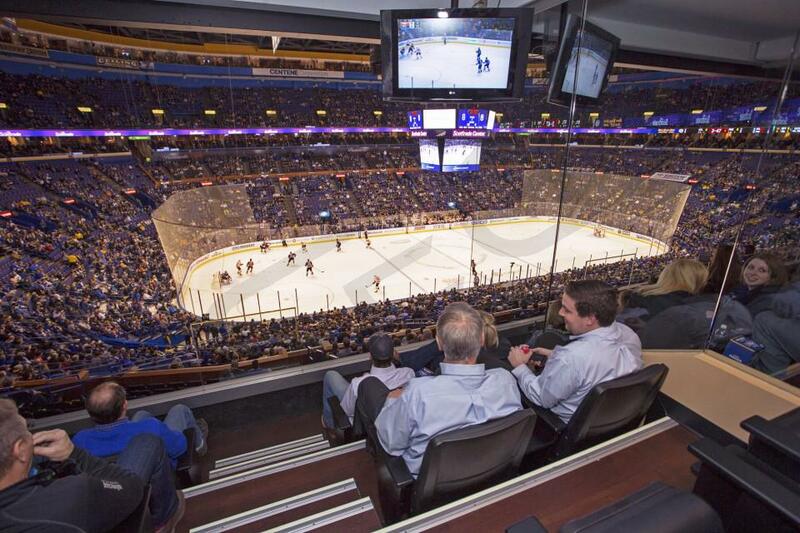 For Blues hockey games, Club Level suite prices will range from $4,000 - $6,000. Penthouse suite prices will range from $2,000 - $2,800. Double suite pricing will be from $3,200 - $5,000. The better the opponent the Blues are playing, the more expensive a Blues suite will be most likely. Luxury suite prices for concerts and other events at Enterprise Center can vary widely based on the type of event. Penthouse Level Suites at the Enterprise Center will overhang the Mezzanine Level making you feel close to the action. For a St. Louis Blues game, a Penthouse Suite can accommodate between 12 to 16 guests. Blues suites include a private restroom, two HDTVs, kitchenette, closet space and a shared suite attendant. There will be 8 fixed stadium seats in a Penthouse suite with 4 additional bar stools directly behind the seating. Premium in-suite catering options can be arranged prior to your event. A St. Louis Blues Club Level Suite can accommodate groups from 16-20 people. Club Level Suites at the Scottrade Center are considered the lower suite level in the arena. For Blues games, the suites feature private restrooms, HDTVs, interior/exterior seating, premium in-suite catering options and a dedicated suite attendant. With a Blues suite guests will get private entry into the Enterprise Center. A Blues Double Suite will be located on the Penthouse Level. Double Suites are the largest suite option at the Enterprise Center. These Blues suites accommodate groups of 24 - 35 guests. Suite amenities include two private restrooms, kitchenette, closest space, HDTVs and a shared suite attendant. Premium in-suite catering options can be purchased for the suite at an additional cost. You can watch the St. Louis Blues take to the ice at the Enterprise Center, formerly Scottrade Center, from a private luxury box. Between Club Suites and Penthouse Suites, the Enterprise Center offers a wide-range of luxury suite options. A Club Suite will put you closest to the ice and accommodate 16-20 guests. A Penthouse Suite overhangs the Mezzanine Level making you feel like you're right there in the action, perfect for group of 12 - 16 guests.. For larger groups, the Blues Double Suite will be a great option as it can accoommdate groups up to 35 guests. A Blues suite provides the perfect setting for entertaining clients or friends and family. Suites at the Enterprise Center feature private restrooms, HDTVs, interior/exterior seating, kitchenettes and plenty of entertaining space for mingling. With a Blues suite guests will get private entry into the Enterprise Center and a suite attendant to help you on game day. Premium in-suite catering options can be ordered prior to your Blues game so your guests walk into a fully catered suite. You can watch the St. Louis Blues take to the ice at the Scottrade Center from a private luxury box. 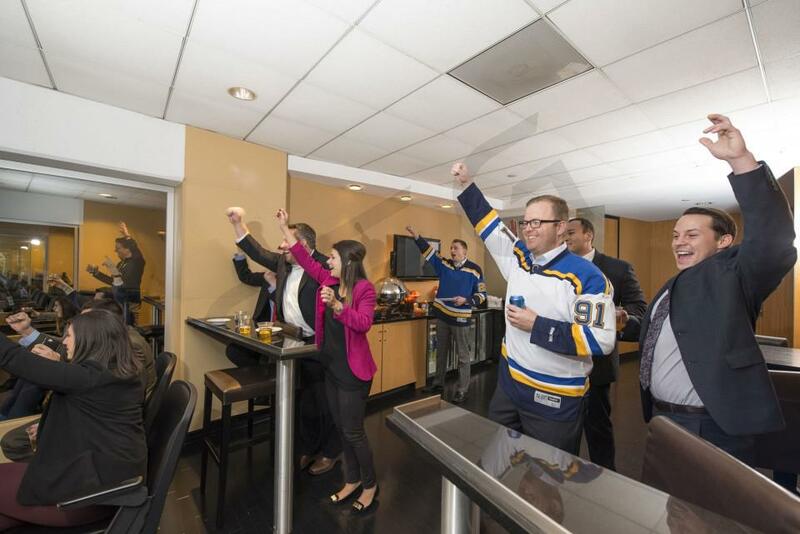 Between Club Suites and Penthouse Suites, the Scottrade Center offers a wide-range of luxury suite options. A Club Suite will put you closest to the ice and accommodate 16-20 guests. A Penthouse Suite overhangs the Mezzanine Level making you feel like you're right there in the action, perfect for group of 12 - 16 guests.. For larger groups, the Blues Double Suite will be a great option as it can accoommdate groups up to 35 guests. A Blues suite provides the perfect setting for entertaining clients or friends and family. Suites at the Scottrade Center feature private restrooms, HDTVs, interior/exterior seating, kitchenettes and plenty of entertaining space for mingling. With a Blues suite guests will get private entry into the Scottrade Center and a suite attendant to help you on game day. Premium in-suite catering options can be ordered prior to your Blues game so your guests walk into a fully catered suite. The 2017-18 St. Louis Blues return to the ice as one of the NHL's best teams. Last season, the Blues advanced deep into the playoffs after finishing fifth overall in the Western Conference. The Blues are led by one of the NHL’s best young goal-scorers in Vladimir Tarasenko. Tarasenko finished with 39 goals and 36 assists last year. Offensively, head coach Mike Yeo, in his first full year with the Blues, will also look to Alexander Steen, Jaden Schwartz, and Paul Stastny to help generate goals. Goaltender Jake Allen will be counted on to play the majority of games in net for the Blues. The Blues came close to reaching the Stanley Cup Finals in 2016, falling just short. They have the talent to finally reach the Cup this year, though. The 2015 St. Louis Blues are serious contenders to win their first Stanly Cup Championship in franchise history. The Blues are the oldest NHL team to never have won the Stanley Cup. In 2014, the Blues lost in the conference quarterfinals to the Chicago Blackhawks. Head coach Ken Hitchcock has his team back in the hunt and ready for another postseason. The Blues have been near the top of the Central Division the entire season. Right wing Vladimir Tarasenko has been the most productive player on the Blues this season. Tarasenko leads the Blues in goals and points. He also could lead the Blues in assists. Other star players this season include Alexander Steen, Jaden Schwartz, T.J. Oshie and David Backes. Defensively, Kevin Shattenkirk and Alex Pietrangelo have helped the Blues becomes of the best defensive teams in the NHL. Goalie Brian Elliot has been in the net slightly more than goalie Jake Allen this season. Both goalies have performed very well for the Blues. You can watch the Blues take to the ice at the Scottrade Center from a private luxury box. A Blues suite provides the perfect setting for entertaining clients or friends and family. A St. Louis Blues luxury suite can accommodate groups from 12-20 people. Suites at the Scottrade Center feature private restrooms, HDTVs, interior/exterior seating, premium in-suite catering options and a dedicated suite attendant. With a Blues suite guests will receive VIP parking, private entry into the Scottrade Center and exclusive access to the Scottrade Center’s VIP lounges. Thank you for signing up for specials at Enterprise Center. Enter your email address below to stay in touch. We'll sign you up for our newsletter, which will inform you of the latest inventory and events at Enterprise Center. We promise we will never sell or distribute your information. 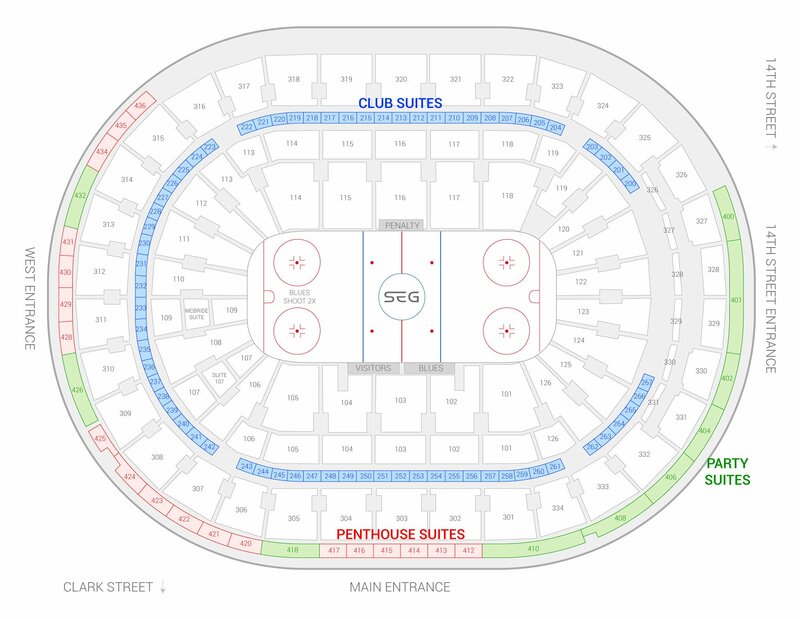 The seating chart below shows where the St. Louis Blues suites at Enterprise Center are located.